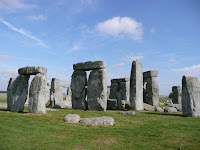 Obviously, I am kidding at saying Stonehenge is just some rocks in a field...it is actually am amazing site, so connected to the movement of the planet and science, nearly impossible to fathom how it was built in its day and completely unknown what it was actually used for. Strangely, it really is just some rocks in a field when considering the surroundings...you are driving through English countryside then off in the distance in one of the many open fields you see some rocks and as you get closer you realise they are the infamous Stonehenge. Its right next to the road and in one of the pictures you can see the country highway through two of the upright stones. Very neat place and a lovely day. We ended our tour by taking a nap in the field at Stonehenge. Just a few towns over is a place called Avebury. Its a small town that has similar stones standing upright around the town. Also a strange sight, many of these stones are in the middle of sheep or cow pastures and people can just go wondering around through all of this property. Along with the stones making a large (and I mean large) circle around the town, there is also what only can be described as a moat. Its a 20 feet deep ravine running around the town. The Avebury stones are also about 5000 year old and their original purpose unknown. But again, very interesting. We found some good lighing late in the day and were able to pose with the stones. Can you tell who is who?